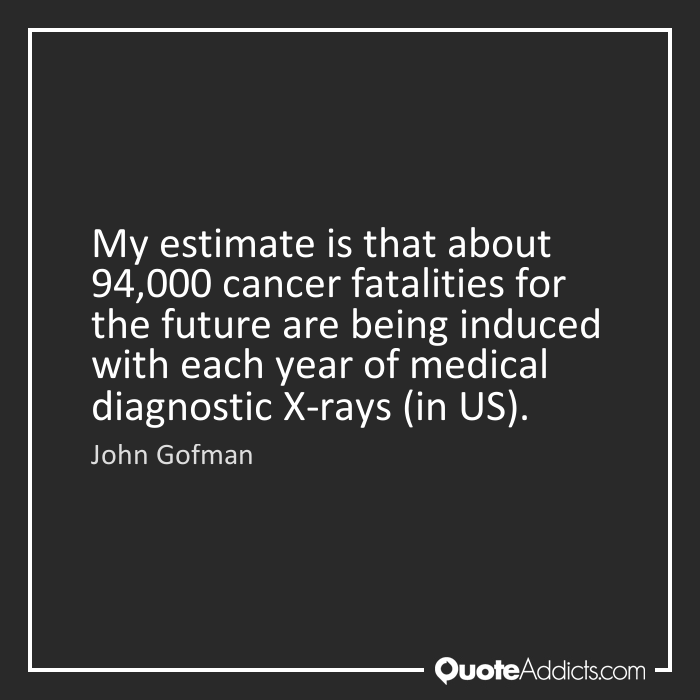 Hypothesis-1: Medical radiation is a highly important cause (probably the principal cause) of cancer mortality in the United States during the Twentieth Century. Medical radiation means, primarily, exposure by xrays (including fluoroscopy and CT scans). Hypothesis-2: Medical radiation, received even at very low and moderate doses, is an important cause of death from Ischemic Heart Disease; the probable mechanism is radiation-induction of mutations in the coronary arteries, resulting in dysfunctional clones (mini-tumors) of smooth muscle cells. If you ask me, "Do you stand against medical x-rays?" the answer is no. And I've written a book with Egan O'Connor on the health effects of common exams. We take the position: if there's a diagnostic gain for you -- something that can really make a difference in your health and your life -- then don't forego the x-ray. But there's another part of the picture. Up until recently -- it may be a little better now than it was -- government studies show that most hospitals and most offices of radiologists didn't have the foggiest notion of what dose they were giving you for a procedure. Nor did they know that the procedure could be accomplished with a third or a tenth of the dose. Joel Gray, a health physicist at the Mayo Clinic, said there are places giving you 20 times the dose needed for a given picture. And, he said, "If you ask those people and they can't answer, you can be fairly confident that they're giving you a bigger dose than necessary." So Egan and I, in The Health Effects of Common Exams, took the data on what the average doses were in the United States, versus what has been accomplished by some elegant work in Toronto to reduce the dose to one-third of what was the average practice in 1984, and found that about 50,000 fatal cancers per year could be prevented. That' s a million and a half in a generation! So what is this stuff about "Most procedures don't hurt you, they're small?" There was a time, 20 to 30 years ago, when there were mobile x-ray units that gave x-rays of the chest. They didn't give the 20 millirads [a 50th of a rad] that is possible today. They gave about five rads. Children went through those things by the thousands. And we just say, "We don't know why this cancer epidemic is taking place now." Nobody's taken account of it. It's hard to know how many children got it and who they were and follow them up. But you know that a certain number of people are having cancers now as a result of what was done 15, 20 years ago. In the '20s we had a radium-dial painting industry to paint the dials of wristwatches and clocks. Women sat at tables with a little pot of radium paint, painting these dials by hand. Their brushes would get diffuse and they'd take the brush and twirl it in their mouths to get a fine tip to paint with. And these women came up with the most horrible bone destruction due to the alpha particles from radium in their bone. Osteogenic sarcomas. It was all written up by 1929, by Harrison Martland, the coroner in New Jersey who examined their bodies. The whole world knew that alpha particles from radium had done this to humans. Now an alpha particle, really, doesn't ask who its mother or father was. An alpha particle is an alpha particle. In Germany and Czechoslovakia there are regions where it was long known that 50 to 75 percent of the miners died of what was called "mountain sickness." I'm not impressed by the integrity and forthrightness of the medical establishment. I wouldn't have said this 10, 15 years ago, but today, when I look at an article in a medical journal -- peer review means nothing to me, that's just an old boys' club -- I say to myself, "Why should I believe this?" I've watched stuff get in that was peer reviewed that was absolute rubbish, and they had to know that it was absolute rubbish. Dr. MacKenzie then studied 800 women who had been treated for tuberculosis in one hospital between 1940 and 1949. He found that women who had not had "artificial pneumothorax therapy" had a 1-in-510 chance of getting breast cancer; women who had had the therapy had a one-in-21 chance of getting breast cancer. In other words, women who had had many fluoroscopic exams of their lungs had 24 times as great a chance of getting breast cancer as women who had avoided fluoroscopy.